A Marine veteran has been identified as the leader of a white supremacist group whose members marched at Saturday’s “Unite the Right” rally in Charlottesville, Virginia, where a counter-protester was killed. 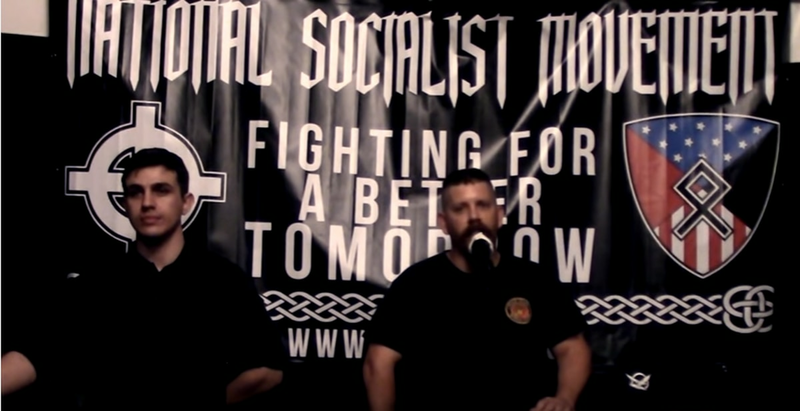 The news site Splinter first reported on Monday that former Marine recruiter Dillon Ulysses Hopper is the leader of white supremacist group Vanguard America. Hopper served in the Marine Corps from July 2006 until Jan. 30, leaving the Corps as a staff sergeant, according to Manpower & Reserve Affairs. He deployed to Iraq from January 2008 to January 2009 and to Afghanistan from July 2010 to February 2011. James Alex Fields Jr. was arrested Saturday after allegedly killing a woman by ramming a car into counter-protesters. Fields, 20, was charged with second-degree murder and is being held without bail. 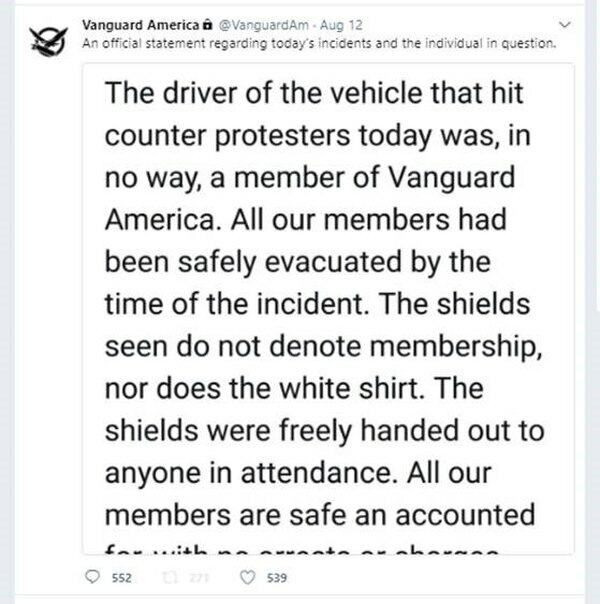 At the rally he was photographed behind a shield bearing the emblem of Vanguard America, according to The Associated Press. The group has denied Fields was a member. Fields began Army basic training in August 2015 but was released from active-duty four months later for “failure to meet training standards,” officials said. Hopper served as a recruiter from 2011 to 2014 and held two other military occupational specialties during his time in the Corps: fire support Marine and information security technician, Corps officials said. Attempts to reach Hopper for comment on Tuesday were unsuccessful. Carla Hill, a Marine vet and investigator for the Anti-Defamation League, tracks Hopper’s group. “I did not see him at the rally over the weekend; and, of course, he apparently said he wasn’t there ― but many of his members were,” said Hill, who left the Marine Corps in 1993 as a sergeant. Hopper appeared at an April 29 white supremacists rally in Pikeville, Kentucky, that was timed to mark Hitler’s birthday, Hill said. At the rally, Hopper said he had been the leader of Vanguard America for more than a year. In addition to being active on Twitter, Vanguard America frequently posted white supremacist literature on university campuses during the most recent school year, Hill said. In a video of the April rally posted online, Hopper said Vanguard America has a presence in 28 states with roughly 200 members. He added that people in Canada, Britain and Australia want to form international chapters of the group. “Association or participation with hate or extremist groups of any kind is directly contradictory to the core values of honor, courage and commitment that we stand for as Marines and isn’t tolerated by the Marine Corps,” said Maj. Garron Garn, a spokesman for Manpower & Reserve Affairs. The Marine Corps has multiple layers of screening to make sure that applicants with ties to white supremacist groups or other criminal gangs are not allowed to attend boot camp, Garn said. Recruiting duty is considered a “sacred responsibility” and has its own thorough screening process before Marines can attend recruiter school, he said. “The guidance to Marines is clear: participation in supremacist or extremist organizations or activities is a violation of Department of Defense/Marine Corps orders and will lead to mandatory processing for separation following the first substantiated incident of misconduct which, in the independent judgment of an administrative separation board convening authority, is more likely than not to undermine unit cohesion or be detrimental to the good order, discipline, or mission accomplishment of the command,” Garn said.